Government troops claim they have now taken control of the Mae Tha Waw area in Karen State following weeks of intense fighting. The fighting was between the Democratic Karen Buddhist Army and the Burma Army and its militia, the Border Guard Force (BGF). A BGF officer on September 19, claimed that the government has taken control over the road link from Mae Tha Waw to Myaing Gyi Ngu. The Burma Army and BGF launched its offensive in early September, 2016 with the stated objective of wiping out DKBA troops in the Mae Tha Waw area. Fighting continues on a lesser scale and BGF sources told Karen News that they have taken over the main bases of the DKBA on the Mae Tha Waw – Myaing Gyi Ngu road. The BGF officer said that the DKBA’s main bases along Mae Tha Waw road include Yate Kha Gon, Kyauk Lone, Gu Thaw Pu and Yaw Pau Khee in Mae Tha Waw areas, Hlaingbwe Township. The recent fighting displaced more than 5,500 villagers in the areas. The majority of the displaced villagers took temporary refuge at Myaing Gyi Ngu and other sought safety near the Thai border. Mu Chanue, a villager from Yaw Khoo Hta who fled to Myaing Gyi Ngu told Karen News that they couldn’t take anything with them when they left. Although the BFG claims control over the area, Mu Chanue is still worried that the fighting will not end and she is uncertain about when to go back home. 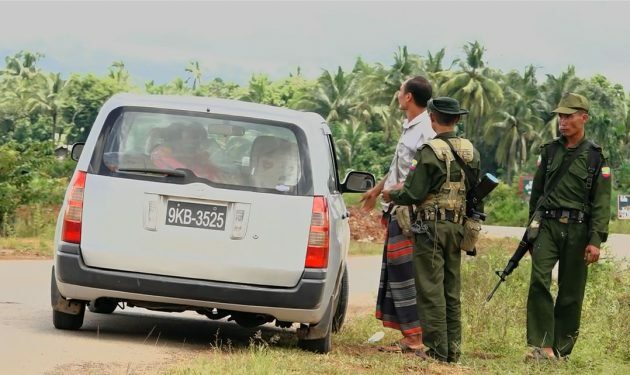 In addition to the concerns of villagers about the increase in the deployment of Burma Army and BGF troops in the areas, the recent fighting also saw the use of landmines – another threat to returning villagers. Saw Htoh Day, a village chief from Upper Kyunhtaw village stepped on a landmine on September 16, and died from his wound. Saw Htoh Day trod on the mine as he tried to run from his village to Myaing Gyi Ngu temporary shelters. Although there have been reports of a large number of casualties from the recent fighting, there is no official confirmation of the figures. Tension between the BGF and DKBA troops in Mae Tha Waw areas increased after DKBA troops in the area announced an offensive against the BGF on September 1. After that the DKBA carried out several small attacks on BGF bases and the fighting intensify after the Burma Army and BGF militia increased reinforcements in the areas.